Congratulations to the Stanford Club athletes who earned USA Water Polo Academic All-American honors! The first shipment of books is making its way across the country — they will be here by Thursday! In the meantime, take a sneak peak at the Foreword (written by JT), the Prologue, and Chapter 1: The Journey, which features Brenda Villa. Congratulations to three Stanford club alums who earned Collegiate All-American Honors! Fun Q&A with club alum Katherine Moore of the Michigan Wolverines! 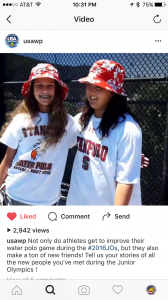 The Stanford Girls Water Polo Club has a long history of hosting events and matches for the women’s national team and Olympic team. How long a history? Since the 2000 Sydney Olympic Games, the debut of women’s water polo in the Olympics, when we hosted Team USA and Russia for the “Sendoff to Sydney.” These two teams went on to win the silver and bronze medals at the Olympics. The gold medal game in Sydney between the United States and Australia was played in front of the largest water polo crowd ever – 17,000 spectators – and the teams battled to the last second. Kyle is dropping everything – teaching and coaching (except for the fall age group team!) – to write the story of women’s water polo’s long-overdue inclusion in the Olympics and Team USA’s journey to Sydney. Stanford’s role as host of the Sendoff to Sydney will feature in the story! Check out the book website and like the Facebook page. Please forward these links to your high school teammates and families. There will be a Kickstarter campaign launching on September 23 – the 15th anniversary of the gold medal game!